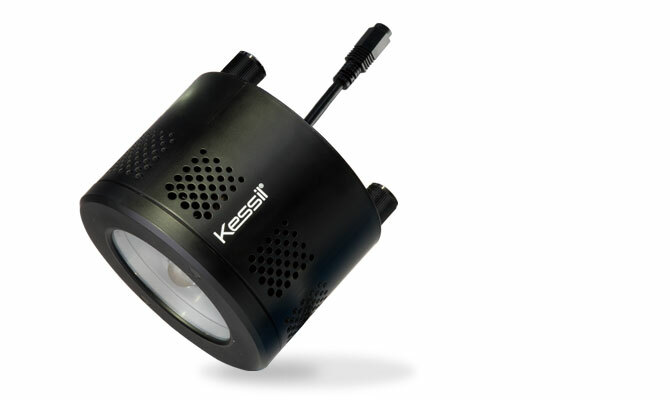 If you want premium lighting for your aqua-scaping, then there is no going past the Kessil A360WE Tuna Blue. The beautiful shimmer from the Kessil LEDs is second to none and will give you that amazing flicker normally only seen in natural sunlight. The proprietary blend of UV light enhances coral growth and colour while the Patented Dense Matrix LED technology ensures the best depth penetration without sacrificing coverage or colour mixing blends. Different light wavelengths within a single LED array are seamlessly blended before leaving the light, emitting a uniform colour with widespread coverage. Compact and sleek design features quiet operation, innovative heat management, and efficient, long-lasting LED construction. To round it all off, you can tune the spectrum and intensity for a personalised look, or for larger displays, you can daisy-chain multiple lights with the compatible link cable for seamless control from a single source. Dimensions - 3.6" x 4"
TMC run the A-Series Kessil LED's instore! Come on in and have a look at the quality for yourself.